Have your earth, muck, green waste, tarmac and/or topsoil removed from your site with L. Benson & Sons Earth Moving & Muck away service. 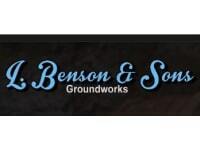 L. Benson & Sons Groundworks offer a wide range of services including digger & dumper hire, bricklaying, concreting, foundations dug out and laid, driveways laid, new patios, patio refurbishments, decking, drainage and soakaways and much, much more. Contact us today for a free no obligation quotation - you won't be disappointed. L. Benson & Sons Groundworks - Making neighbours jealous for over 30 years. Excellent workmanship,and very very impressed!! Thank you.